Working on your feet all day can be painful if you have the wrong footwear. And when your feet hurt, it’s hard to concentrate on anything else. For men and women that work on their feet all day, RefrigiWear developed a new footwear enhancement that enriches the comfort and also offers superior slip resistance. VitaComfort features several features that help take care of your feet so you can concentrate more on your tasks. The unique honeycomb design and materials enable more comfort, breathability and shock absorption – leading fewer aches and pains in your feet, knees and back. 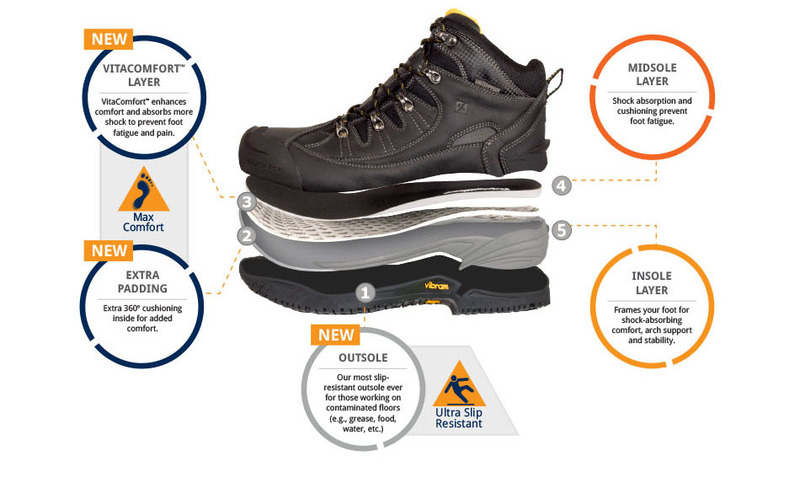 InduraSafe™ Ratings indicate the level of Insulation, Durability and Slip Resistance a boot provides. The ratings are on a scale of 1-10 with a higher number meaning a better rating. The insulation rating is determined by the factors contributing to the warmth a boot provides. The material, construction and the anticipated lifespan of the boot help indicate durability. Slip resistance relies on the outsole and Mark II Slip Resistance Testing. The VitaComfort™ layer provides comfort and shock absorption that helps curtail foot, knee and back pain. Paired with a gravity-fed moisture management system that wicks away perspiration and allows feet to breathe, the VitaComfort™ helps you forget about your feet so you can focus on what really matters – the job. The new footwear also features our new Vibram® outsole, designed exclusively for RefrigiWear to combat slips and falls. The sole boasts a diamond tread design and Vibram’s proprietary XS Work compound to maximize durability and grip on contaminated surfaces.